Last year, when a federal court in Texas handed down indictments charging Stanford International Bank (SIB) and its officers with “orchestrating a fraudulent, multibillion dollar investment scheme,” I wondered: was there more to the story? Once described by fawning media as a “flamboyant Texan” and “philanthropist,” Stanford was founder and sole shareholder of a global banking empire once conservatively valued at $50 billion. 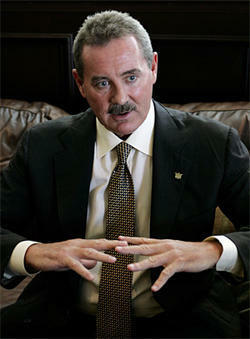 According to the federal indictment, “Sir Allen,” (R. Allen Stanford) as he was dubbed by a corrupt former minister of Antigua, ran a massive Ponzi scheme camouflaged as a bank that sold some $7 billion in self-styled “certificates of deposit” and $1.2 billion in mutual funds. Operated from behind a façade of well-appointed offices and with a jet-set lifestyle to match, the SIB grift may have been impressive but it was a scam from the get-go. Lured by “high rates that exceed those available through true certificates of deposits offered by traditional banks,” thousands lost their shirts. Those high rates were a lie and the bank’s “unique investment strategy” about as legitimate as a penny-stock fraud or advance fee scam on the internet. Of the $8 billion hoovered up by the banker and his cronies, only about $500 million have been recovered. Facing the prospect of years in prison, The Miami Herald reported that SIB’s chief financial officer James Davis, once Stanford’s college roommate and originally charged in the indictment, copped a plea to save his own neck. And with connections and generous pay-outs to U.S. politicians going back more than a decade, 65% of which went to Democrats including our “change” president, Allen Stanford was plugged-in. Allen Stanford did business the American way; he swindled depositors and then siphoned-off the proceeds into a spider’s web of offshore accounts. In all, 28 numbered accounts were listed by prosecutors, veritable black holes that escaped scrutiny; that is if regulators in Washington were minding the store, which they weren’t. Years earlier, SEC investigators at the commission’s Ft. Worth office uncovered evidence of wrongdoing. According to an explosive report by the SEC’s Office of the Inspector General, Ft. Worth examiners launched a series of probes in 1997, 1998, 2002 and 2004 exploring SIB practices but their diligence was sabotaged by high-level officials. That report, Investigation of the SEC’s Response to Concerns Regarding Robert Allen Stanford’s Alleged Ponzi Scheme, Case No. OIG-526, March 31, 2010, paints a damning picture of the regulatory process. Senior managers called the probes a “goat screw” and ordered them killed. Cynics might see something untoward here, but I think it’s all just a coincidence, like drug planes bought with bundles of cashlaundered through American banks. In 1986 during the Iran-Contra period, Allen Stanford’s Guardian International Bank set up shop on the sleepy Caribbean isle of Montserrat (pop. 5,870). It didn’t take long before the bank came under scrutiny. Guardian was the subject of a joint Scotland Yard-FBI investigation “into so-called ‘brass-plate’ banks,” The Independent disclosed. During the Iran-Contra scandal, congressional investigators and journalists scrutinized links between Colombian drug traffickers and the CIA’s Nicaraguan Contra army. A decade later, largely as a result of outrage generated by the late Gary Webb’s Dark Alliance series, a memorandum of understanding between Reagan’s Justice Department and the Agency entered the public record. That 1982 memo legally freed the CIA from reporting drug smuggling by their assets. The former federal agent told The Independent, “We had hard intelligence about what he was doing and we began to develop it” but the investigation died or more likely, killed, by officials higher-up the food chain. Despite suspicions, it appears that Stanford was golden as far as the feds were concerned; just another guy with an endless supply of “get-out-of-jail-free” cards. Was Stanford’s bank a black hole which U.S. intelligence agencies could exploit, in the interest of “national security” mind you, and therefore exempt from “normal disclosure obligations” asBusinessWeek averred? If this were so, then even if Stanford were an informant he could have continued to launder drug money and profit nicely; such gentleman’s agreements are not without precedent. One need only glance at internal U.S. government documentsreleased by the National Security Archive, documents which revealed the Cali cartel’s close collaboration with corrupt Colombian police, neofascist paramilitaries and the CIA when Medellín drug lord Pablo Escobar was run to ground. Pointedly, was Stanford’s banking empire another in a long line of institutional channels that drug cartels and the CIA could both profit from? Readers need only recall illegal activities by institutions as diverse as Paul Helliwell’s Castle Bank and Trust in the Bahamas, Frank Nugan and Michael Hand’s Nugan Hand Bank in Sydney and the Cayman Islands, or the far-flung empire of Agha Hasan Abedi’s Bank and Credit and Commerce International. In the late 1990s, court documents revealed that “operatives of the Juarez cartel began opening accounts at Stanford’s Antigua-based bank,” laundering profits amassed by the Amado Carrillo Fuentes organization, the late “Lord of the Heavens” referred to in the BBC report. The Chronicle notes that Fuentes’ representatives “used Stanford International Bank to open 10 accounts and deposit $3 million.” We should bear in mind however, these represent onlyknown accounts. Were there others? Federal and state investigators have said that there were. During the same period, Texas state securities regulators uncovered more evidence of money laundering by Stanford entities. But because it involved offshore banks, they “referred it” to the FBI and SEC. One would assume that evidence of serious wrongdoing would be motive enough to take a hard look at the allegations and not concoct a fairy tale that these charges lie “buried in the paperwork”! One possible answer may revolve around charges that SIB’s Venezuela branch was a conduit for laundered CIA funds. Months before Stanford’s empire collapsed, Venezuela’s socialist government launched a raid on SIB offices in Caracas. Stanford’s reticence is certainly understandable, considering Frank Hand’s fate 30 years ago. Despite evidence uncovered by investigations going back to the 1980s, drug money laundering charges or any reference to Agency activities will not figure in the Justice Department’s case when Stanford goes on trial in January. Underscoring the federal government’s reluctance to explore this dark corner of Allen Stanford’s career, it might do well to keep in mind what one airline executive told investigative journalist Daniel Hopsicker during his probe into the 9/11 attacks.